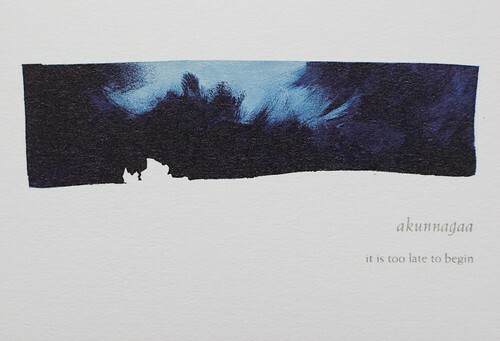 Drawn to winter and the words that describe the ephemeral state of ice, cloud, and culture within the Arctic Circle, artist and anthropologist worked. In this bitter-cold season, they studied and shivered, researched and reacted to nature stripped of its adornments. 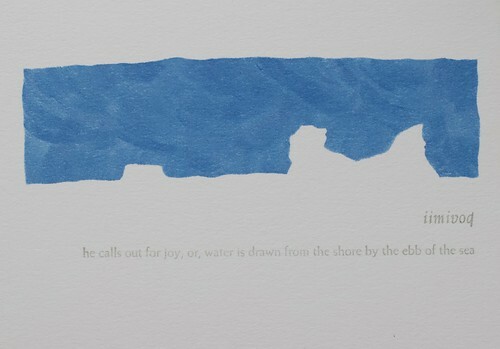 Curiosity over how climate shapes the character of people and their language brought printmaker-poet Nancy Campbell and social anthropologist Mark Nuttall to Greenland. With its huge ice sheet–which covers 80 precent of the island, is more than 100,000 years old, 2-miles thick, and holds about 8 percent of the Earth’s fresh water, Greenland greatly influences global climate patterns. As its ice sheet melts, sea levels rise, temperature fluctuates, and ocean circulation patterns change. 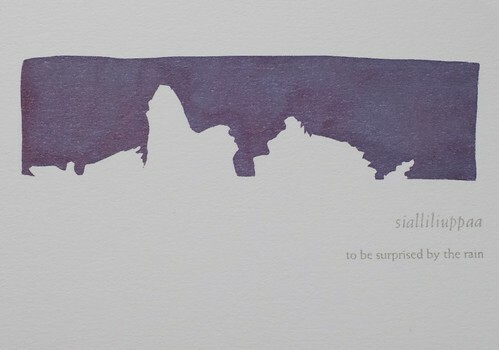 Sialliliuppaa — To be surprised by the rain. 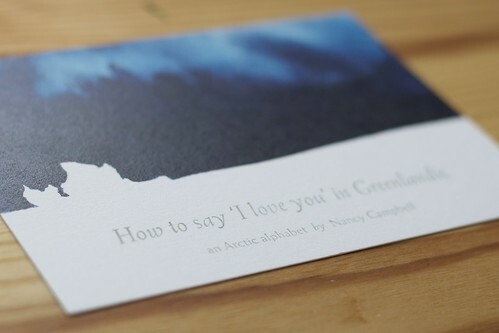 All images are from “How to say ‘I love you’ in Greenlandic,” 2014 postcard edition published by Miel. “Their world is a rapidly changing one, in which the movement of animals, the surging and retreat of glaciers, the dripping and trickling sounds of meltwater, the texture and distribution of thinning sea ice, the increasing frequency and ferocity of storms, and the forces of coastal erosion mean something powerful and extraordinary — but also worrying,” Nuttall said. Whether Nuttall and Campbell crossed paths in their time on the island is less important than how their individual work, when layered, is an intuitive and illuminating response to climate disruption. The Earth has experienced global climate upheaval in the past, but this is the first time one species is driving the change–and we know we’re doing it. The story of the geologic age of humans, the anthropocene era where human activity is the dominant influence on climate, is being told by all. “With a story, people can endure catastrophe. And with a story they can gather the energies to change their lot,” said Thomas Berry (1914-2009), a pioneer in the field of religion and ecology. To tell this story, one needs language, and some of this vocabulary can be found in Greenland’s indigenous weather words and relationship with environment. 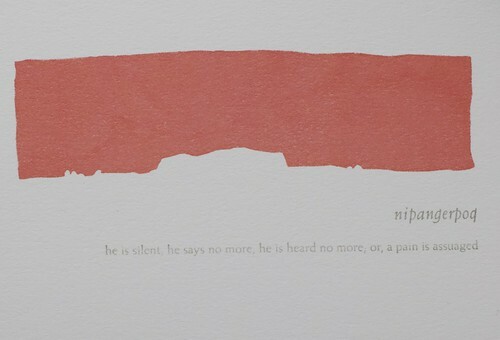 Nipangerpoq — He is silent, he says no more, he is heard no more; or, a pain is assuaged. The Greenlandic language Kalaallisut is a sophisticated tool to read, experience and talk about the environment, self, and people’s relationship with one another, Nuttall wrote in the trade publication for the American Anthropological Association in March 2018. Kalaallisut is a polysynthetic language, which means words are formed with a root, one or more affixes, and a suffix, thus one very long word can replace an entire sentence in other languages. “Their daunting words express concepts that other languages tiptoe around with a phrase but, when spoken, the suffixes are uttered so softly that an untrained ear cannot hear them,” Campbell wrote. 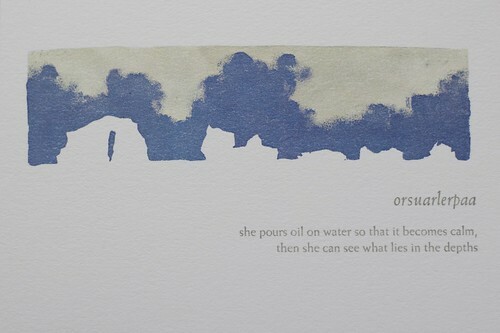 Orsuarlerpaa — She pours oil on water so that it becomes calm, then she can see what lies in the depths. Campbell learned that the first written history of the language was set down by Danish missionaries in Greenland in the 18th Century. In 2009, Greenland achieved autonomy from Denmark, and Kalaallisut, now considered threatened, re-claimed its official status. Intrigued, Campbell borrowed an old Greenlandic-English dictionary from a museum only to discover the bowdlerized English definitions as puzzling as the original Kalaallisut. 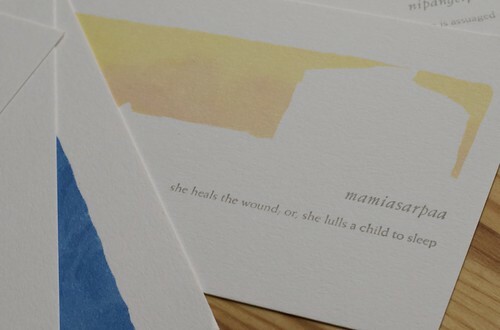 Mamiasarpaa — She heals the wound; or, she lulls a child to sleep. 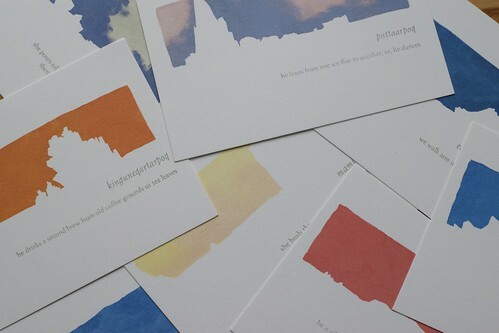 The printmaker-poet chose twelve words and their English definitions to accompany stenciled or pochoir prints of icebergs using a color palette that evoked Greenland’s muted landscape and bright houses. They were reprinted as postcards in 2014 and 2016. “The Arctic landscape is forged from water,” Campbell said. “Glaciers advance, churning a path through basalt cliffs, and thunder into the oceans. The fast ice creeps across the bay, extending the shoreline by a mile and more, only to banish on a stormy night. In calmer weather icebergs drift with the tide, forming protean mountain ranges on the horizons; as their peaks crumble, they turn to restore their balance as slowly as dreaming sleepers do. Campbell seeks innovative ways to engage people with environmental issues, while Nuttall is part of a team using language to help scientists understand and assess current and future climate changes to both ice and individual. Iimivoq — He calls out for joy; or, water is drawn from the shore by the ebb of the sea. The Kalaallisut word for weather is sila, a word that means not only “air,” “outside,” and “world,” but also defines a person’s mind, consciousness and the senses, according to Nuttall, who argued that weather words likely will grow in import as we live in an increasingly unpredictable world. How self-awareness will factor into our reshaping of the world remains to be determined. Instinctual desires to nurture and protect–which span species and time–could increase alongside climate threat. “It seems likely that the emotional circuits invoked when we contemplate our deep evolutionary affinity with other creatures … will turn out to map closely onto the circuits that drive our parental instincts,” cell biologist Ursula Goodenough said. The navigation of a changing world requires great awareness of one’s surroundings, and a flexible and finely-tuned vocabulary. With such skills, anthropologist and artist remain hopeful. 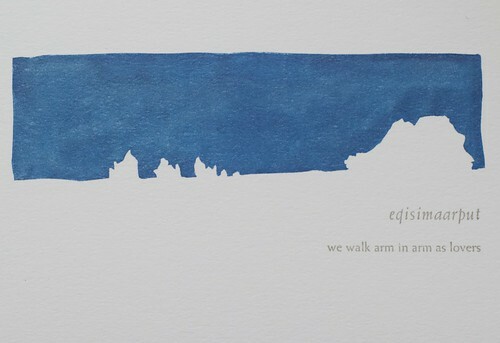 Eqisimaarput — We walk arm in arm as lovers. Greenland tourist guide to climate change. Three places to find “How to say ‘I love you’ in Greenlandic,” (public library) or at Miel. Instagram love for Greenland’s subdued landscape and happy-colored houses. The athlete responds to winter’s waning — two articles from The New York Times. Thomas Berry and Ursula Goodenough.